The 500th anniversary of the Reformation is coming up on October 31st. 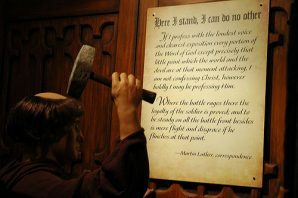 This is the date when, 500 years ago, Roman Catholic monk and professor Martin Luther nailed his 95 Theses to the University of Wittenberg’s chapel door. Nailing a tract on the door was not in itself an act of rebellion, but rather the usual and customary method of starting a discussion among scholars of religious points of the day. It was the 16th century’s version of the internet. However, Luther’s theses were not just questions and discussion points, but a devastating critique of Roman Catholic practices. Luther had found in his studies that Roman Catholic faith and practice varied greatly from the word of God. Luther was especially upset over the practice of Indulgences, or payment to the Church for reduction or absolution of certain sins. Paying for sins to be forgiven seemed incredibly wrong to Luther. He wrote up his questions, intending to spark a discussion.